Provisional Authorization allows you to send trial notifications without receiving the user's consent first. Before iOS 12, you had to request authorization with a system request to send notifications on iOS devices. To increase the opt-in rate of users registered in the push notifications. Apple has decided to implement the provisional authorization. Provisional authorization is an automatic trial of push notifications from your app. So, you don’t have to ask the user for permission to deliver this kind of notifications. It can help your users make a more informed decision on whether they want these notifications or not. 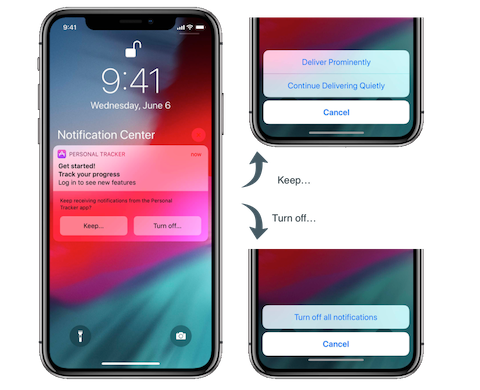 Contrary to classic push notifications, ones sent using the provisional authorization will be delivered quietly only show up in notifications center, and they don't play a sound or vibrate. They also won't show up on the lock screen. You can now ask for provisional notification authorization using +[BatchPush requestProvisionalNotificationAuthorization]. This method does nothing on versions lower than iOS 12.